Are you on Pinterest? Are you using Pinterest for a search engine for ideas? Is your brand on Pinterest? Many companies are experimenting with Pinterest. I’m very observant (and sometimes slightly obsessed) with Pinterest campaigns, sweepstakes and contests. I participate in them to see how they are run and what goes wrong or how it makes an average Pinner like myself feel. In this case, it was about a brand and their experimental marketing of their own content to drive traffic to their e-commerce website. I just read last month in the Minneapolis Egotist (must check out if you haven’t yet) about a very unique brand I don’t know much about UNIQLO. They made a big splash with a campaign that they claimed had no paid media, with over 55 Million Impressions in just 5 days. This post isn’t about critiquing this campaign actually– even though it would drive me crazy seeing pins like that– I literally would curse this brand’s name. As of December 11th though the pins can’t be found on their board (good call they actually do remove them). 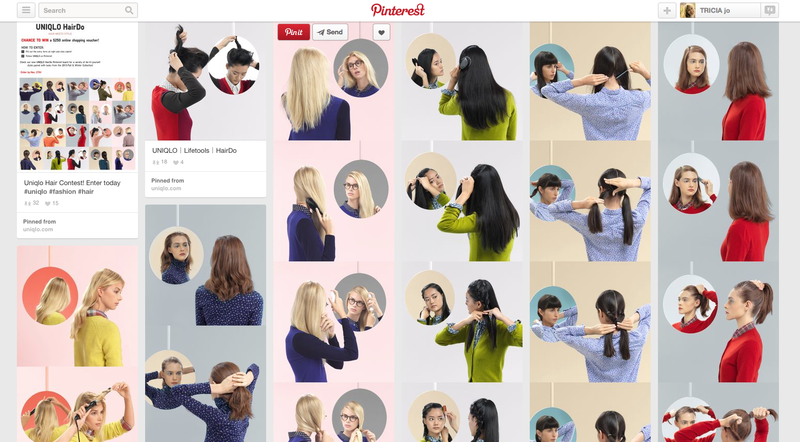 Content that was done well caught my eye within their profile: UNIQLO Hairdos. Incredible imagery to drive traffic to even more info on how to style the hair. How much effort probably went into this content? Hiring a stylist for 1 day and then shooting the girls doing their hair (the stylist doing it in between takes) then a designer / Art Director to review photos and compile either gifs or single panels to describe the “how-do”… then getting the images on Pinterest through the URL’s on the website is easy; it takes about 30 seconds do that for each Pin. Probably will need a writer on that to cleverly draw users to the website and people to relate to the pin. Now let’s try and cut some costs shall we? Get an Art Director that knows simple everyday fashion themselves. Also someone who is social savvy to think about the layout of the images with the photographer and different shots to use later (after the Pinterest content). Sounds like you need someone like this MNdesignGal on set. Wait– is that you MN Design Gal? The clothes could be donated by a related or Co-Promoted brand, or unmarked Wal-Mart turtle necks that mean nothing. The hair stylists should be interviewed and provide feedback to a copywriter. Really cut costs and get a hairstylist that also is a copywriter. The photographer could be an up and comer too (like my sister Trina), someone who has their own blog that can shoot many photos with fast editing time, it also helps to get friends and models that have little acne or facial hair. Who ever said you need real models? Local celebrities or bloggers can make perfect models too! This also will help with your impressions and reach on the campaign. They will for sure share their hairstyles with their incredible following. A behind the scenes tweet, blog post or content for the brand’s Facebook is perfect. It can also create buzz before the final content is up, think of writing a preview piece. Don’t worry about competitors taking your idea, your turn-a-around time isn’t 10 weeks, it is MAYBE 10 days. Your copy is already written before the photo shoot right? Think of Prom and Homecoming, New Years and Spring break timing for a hairstyle focus posts. Many people will be looking for pins on this topic. If you can ever bring in a #wedding tag or two, that can also help drive traffic since that is 24/7 – 365 pin traffic. Overall, great job by this unique brand UNIQLO. I now follow all their boards. Feel inspired? This entry was posted in think-tank and tagged blog, blog fashion, blogging ideas, do it yourself, easy blogging ideas, Fashion, hair styles, UNIQLO, UNIQLO's by mndesigngal. Bookmark the permalink.